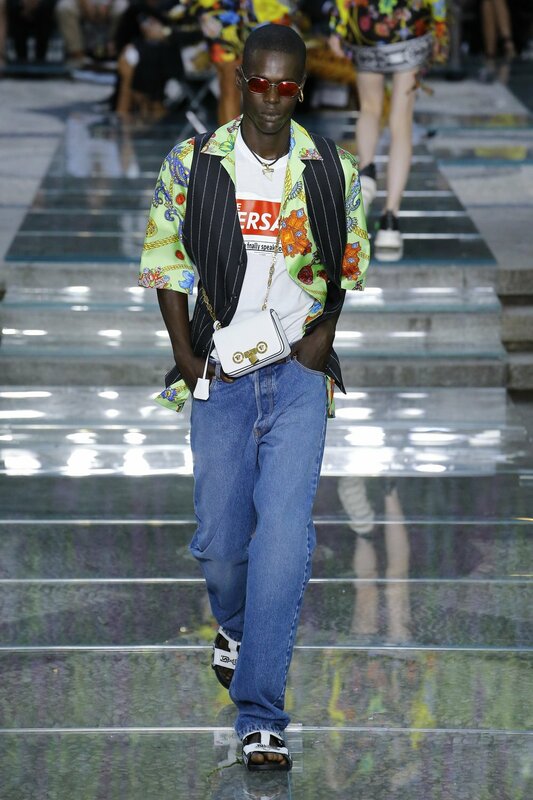 It’s safe to say SS19 was one of the more noteworthy 'menswear' months - an antiquated moniker since luckily near every show is co-ed or genderless - of recent memory. 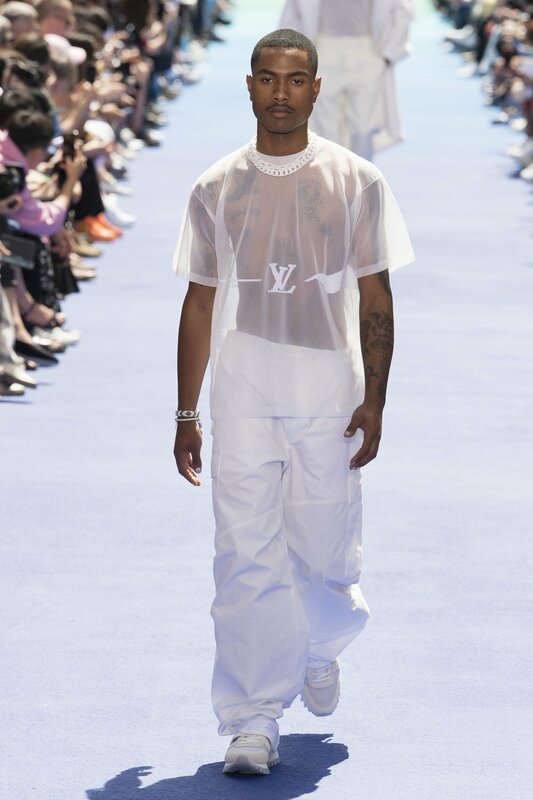 Two big shifts within LVMH, Virgil Abloh for Louis Vuitton and Kim Jones for Dior Homme, saw their debut (Kris Van Assche's Berluti is coming January 2019) and a prodigal son suspiciously shaped like Raf Simons returned to Paris. 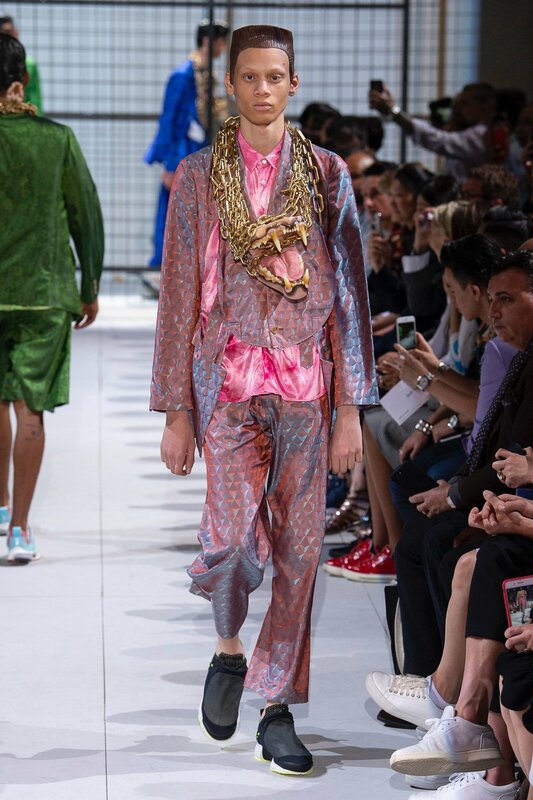 Dries Van Noten staged his first show after announcing the surprising majority stake of the Puig Group after 32 years of independence, Margiela debuted men's couture and finally, Walter Van Beirendonck came out most powerfully after a whirlwind couple of months. Hell to the liars, here we go! 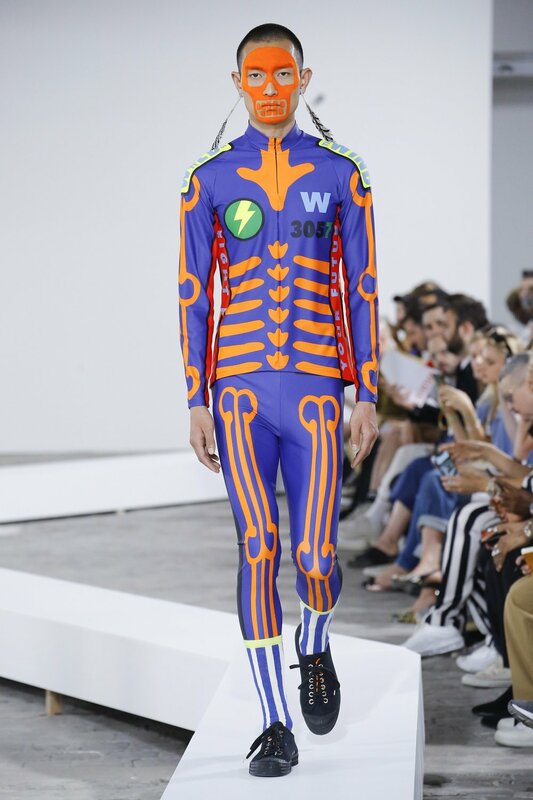 The SS19 Walter Van Beirendonck show was a forceful gale of inspiration and prowess. 'WILD is the WIND' indeed. As mentioned in the KNOTORYUS interview, Walter came up with the collection title a while ago but felt it became more fitting with time. With covers of the 1957 original 'Wild Is the Wind' song by Johnny Mathis as performed by Nina Simone, David Bowie and George Michael playing at the show, the collection became a riotous culmination of spectral colour and patterns notably featuring the official new Walter peace hand signal, duck and donkey prints, neon skeleton cut-outs, harnesses and prints paired with gobsmacking René van den Berg clogs sometimes adorned with fighter plane nose art, FakbyFak eyewear and Novesta sneakers. There were Walter headshot appliqués and roaring creeds like 'HELL TO THE LIARS'. Featured artwork prints were created by Michael Swaney, an artist the designer sourced via Instagram (another reminder to put your stuff out there). 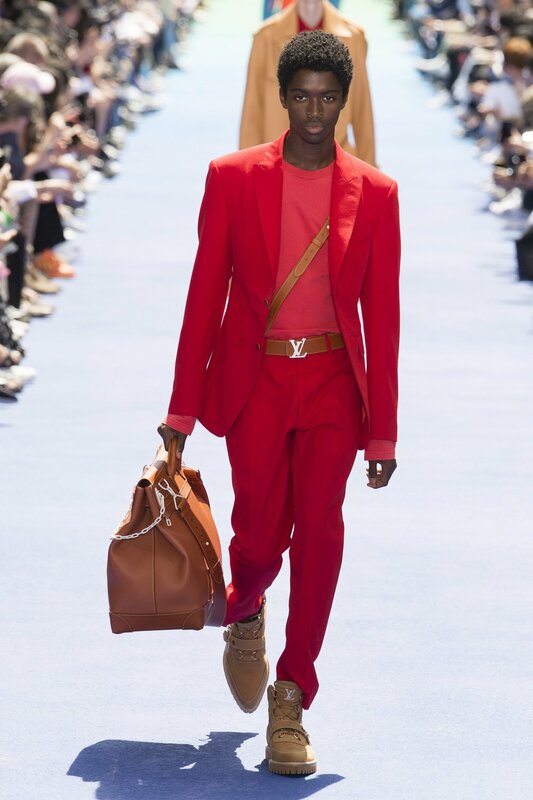 A prismatic, 200-metre hand-painted vast runway set the stage for a momentous fashion gathering: Virgil Abloh ascended to those lone industry heights with his first outing as Louis Vuitton’s menswear director. The “We Are The World” collection was an all-inclusive, thoughtful, joyous, global affair replete with personal symbolism (a literal vocabulary was created by the ever detail-focused Abloh). 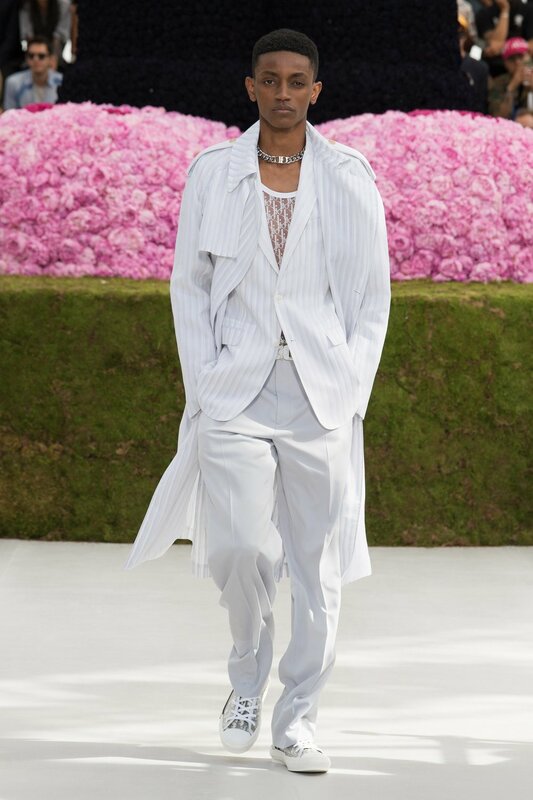 The artists and stars lined up in droves, of course, either as guests like Naomi and Rih or as models like Kid Cudi, Dev Hynes and Palace’s finest Lucien Clarke and Blondey McCoy. Detractors will always suss out points of critique, sometimes valid, but the clothing was almost secondary to the symbolic weight of the moment. Yes, those porcelain chain-link and translucent bags will be damaging many a savings plan in the following months. 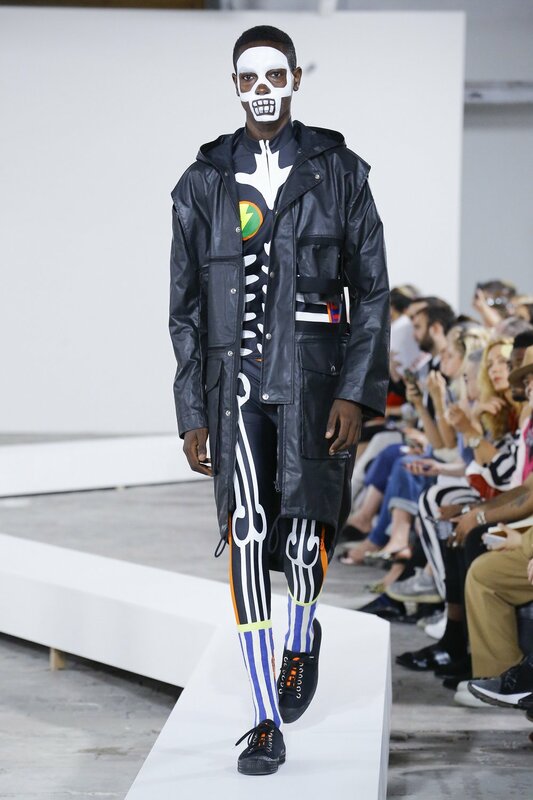 But most poignantly, for Abloh's diverse group of avid followers - and we will still be giving trailblazer Ozwald Boateng his flowers - this was a necessary reminder for one central idea: “You can do it too”. 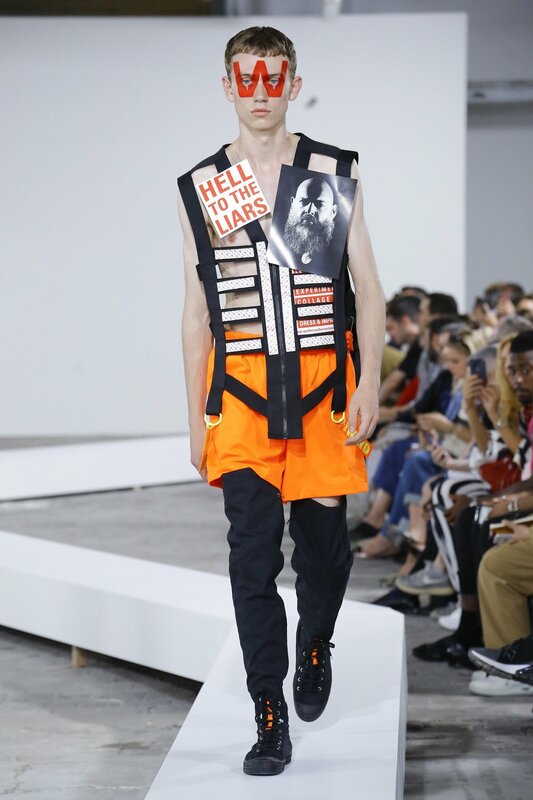 Fresh off of that notable Diesel collaboration, there’s more Glenn Martens for you to bookmark. A haunting technique encroached on most designs in Y/Project’s SS19 show: a Lycra and nylon removable wrap slithered over structural garments such as wide-shouldered perfectos and wide-collar trenches, giving the appearance of wrinkled, shedding skin. Perhaps even a gymnast weirdly bulking up by wearing their costume over regular clothes. Y/Project designs are never straightforward, the eye needs to adjust and the mind needs to wander. Always a treat. 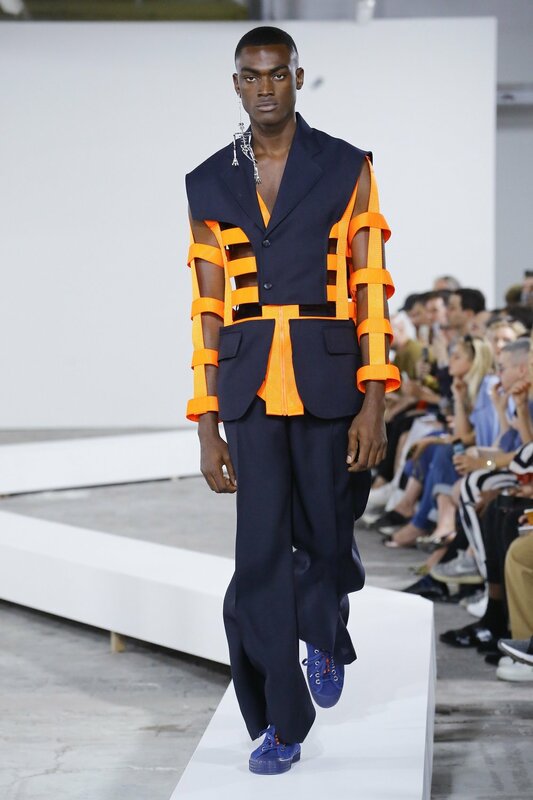 After staging the last three seasons in his adopted home of New York, Raf Simons returns to Paris with a trusted splash of New Wave moodiness. For SS19, the focus lay heavily on couture sensibilities for the people serving looks on these city streets. An enthusiastic use of duchesse satin (notoriously difficult to manipulate) ranging from arctic blue to magenta was offset by satin tees printed with scenes of London punk life, satyr-like footwear, jewellery appliqués and tongue-in-cheek plastic beer nets upgraded to leather accessories. I actually had a dream about one of those satin coats, explaining the skill it takes to work the fabric to friends like I was some kind of got-damn couturier. Literally dreamy stuff. You should definitely give the newly-minted Margiela podcast “THE MEMORY OF” a listen, in the first episode John Galliano expertly describes the art of cutting on the bias in his trademark dulcet Anglo-Iberian tones. It’s great stuff. 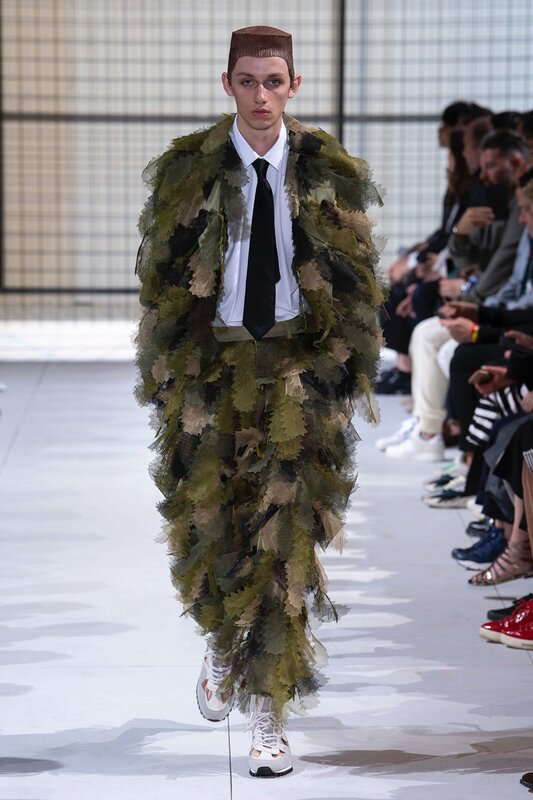 As was the case at Raf’s, couture for men seems to be trickling steadily out of Paris now, outside of the official haute couture schedule - an important thing to note. But if anyone should be producing "men’s" couture, it’s Juan Carlos Antonio Galliano. 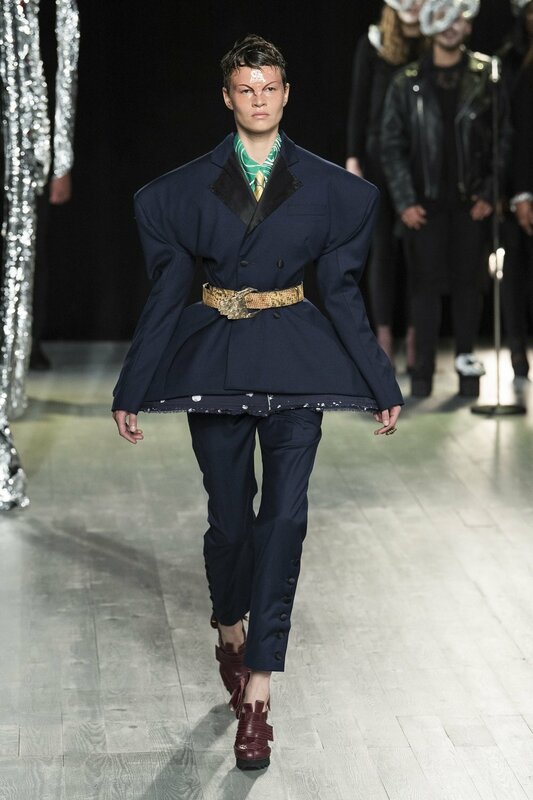 Firmly sidestepping gender conformity, the first Maison Margiela 'Artisanal' Men's collection is a vinyl-limbed, youth-inspired, bias-cut, high-glam, ostrich-hemmed, cowboy-tipped, corset-cinched look-fest not to be ignored. It's all in the details. Like the pearl choker with 'bloody' droplet pendants, reminiscent of the French Revolution-era "costume des victimes" style of wearing a red ribbon around the neck to echo the guillotine - a theme first explored during Maison Margiela Fall 2016 Couture. Masterly. Or it's simply just 'Dior' now. Kim Jones has arrived and if there were any confusion about who is in charge, the giant KAWS statue backdrop made from 70,000 flowers quickly clears up any foggy memory. A soft and elegantly relaxed affair, there were a lot of nods to the house's past for SS19 - more than I would have expected. The saddle bag re-issues procured wide grins all over, though updated enough from Galliano's Gaucho's with 'CD' hardware designed by Matthew Williams of Alyx. There was the re-issue of the classic Dior 'cannage' design (referencing the cane-backed chairs at the first Dior couture show) in hand-held totes and luggage. Toile de Jouy, normally a loud pattern, was now executed ever so finely in hand-cut feather appliqué shirts. The hand-beading on floral jackets and aforementioned featherwork provided more of the couture emphasis from other major players this season. Not unlike his great predecessor Kris Van Assche, Kim Jones focused on the art of suiting and the reworked double-breasted specimens were particularly handsome with their flanked button placement. Chains and rings and pins were created by AMBUSH co-founder and Dior Homme's Head of Jewellery Design Yoon Ahn, who joined Jones to take a bow, stressing the importance of her role in this tandem. With the largest-ever Dior retrospective just announced, the house seems to be in full-skirt swing again (despite the best efforts of Diet Prada lol). Still giving us exactly what we look for Milan to bring, Donatella and her team didn't skimp on the faux python, ruffles, crystals, tiny bags, newspaper and animal print for SS19. Yes, it's all doing entirely too much but that's what the people are here for. There's an unrelenting confidence and sexual liberation that surrounds these Versace personifications and they're all the more welcome for it. “I’d been looking at cleaners, surgeons, and postmen. They’re the people who have your life in their hands. There was that forgotten savior idea. I liked the idea that people could become angels in their lives by working hard and doing good." Craig Green is transcending with each new turn. Going from his unmistakable imagination into tangible clothing seems like it's an arduous process but the outcome is all the more inspiring for it. Exoskeleton silhouettes, drawstring confections, digital print blanket quilt dresses, shadow mimicry, Nike Flyknit fabric. It's a lot to take in but all ties together because the designer plays on his strengths with renewed, forward-gazing emotional intelligence. There's a reason why the now-iconic Mama Rei-to-Walter quote goes: “No exhibition. 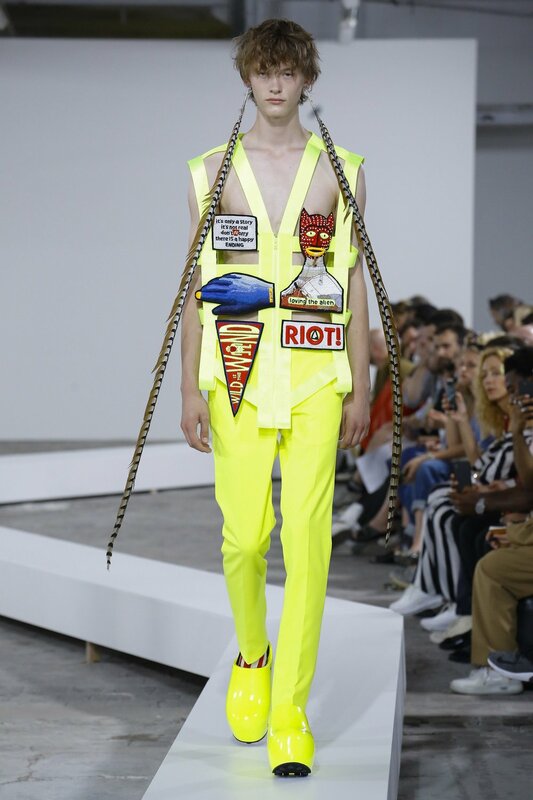 We’re going to do shows.” A CDG runway show is always a frisson-inducing experience and nothing quite says "I'm unapproachable" like a gaping dog's mouth pendant mashing its jaws at the world. 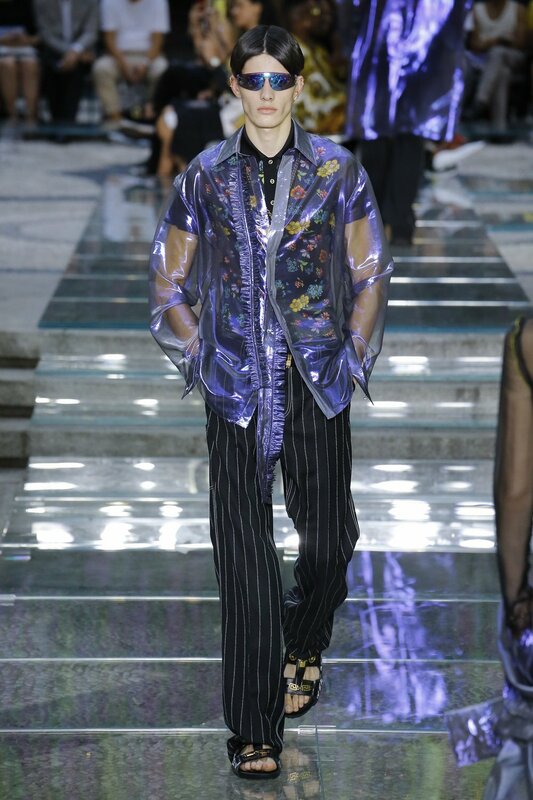 For SS19, we're getting into ruched tailoring, Lazytown wigs, shredded military get-ups and holographic prints. The collection is called 'Crazy Suits' and traditional looks are just nowhere to be seen. Who knows what the true meaning behind it is, but Rei Kawakubo will just not let you snooze on yourself. Hitting their stride, the designer duo behind GmbH looked for 'Survival Strategies' within their latest collection. 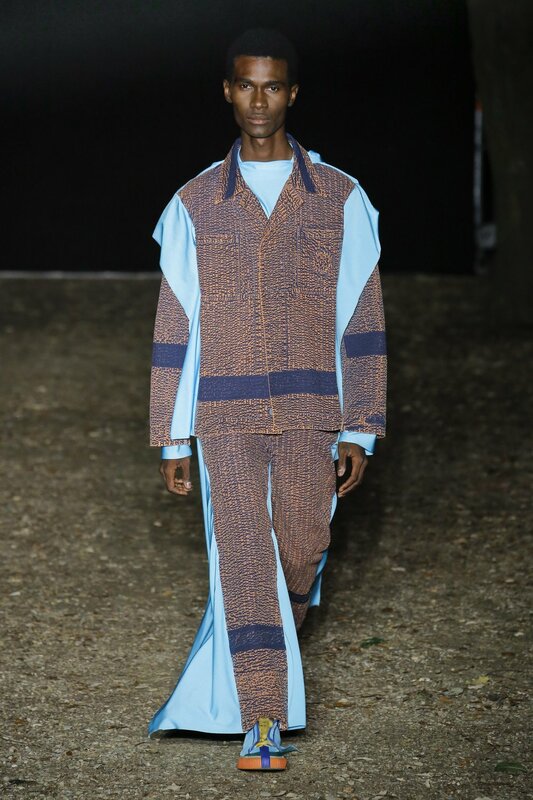 Inspired by the lives of their mothers in Germany of the 60s, who had to grapple with social inequality and racism being immigrants, Serhat Isik and Benjamin Alexander Huseby poured it all out with the result being a standout collection in their curriculum, full of protective styling choices and glossy workwear for all. They're doing not too little, not too much, just enough. A great sign pointing ahead. Coming in hot from Berlin, the SS19 BOTTER show by the unstoppable Rushemy Botter and Lisi Herrebrugh re-establishes why the recent accolades have been coming in aplenty. See all the looks here. Read KNOTORYUS Best Of Menswear Month AW18 here.